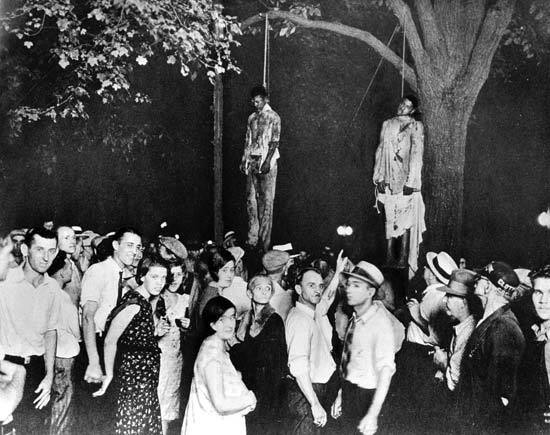 The threat of lynching kept both black men and white women in their places in the rigid southern hierarchies of race and gender. Elites knew that racial violence kept poor blacks and whites from uniting politically. 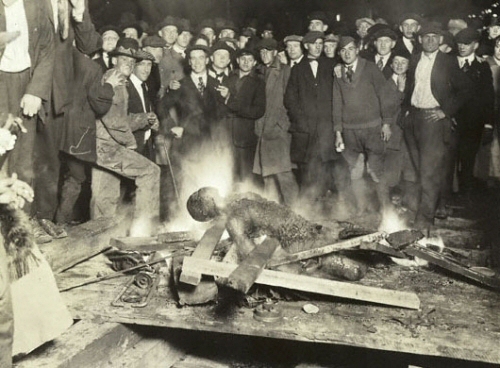 Orlando Patterson, however, asks that we look more deeply into the sacrificial nature of lynching. Of five thousand cases reported between 1880 and 1930 – twice a week for fifty years – at least 40% appear to have most of the attributes of literal human sacrifice, the communal ritual that identified certain individuals as the source of the community’s problems and eliminated them, slowly, carefully and proudly, in public ceremonies. Yes, Melville named his doomed ship the Pequod quite deliberately. Nearly alone in the world, America executes people – 80% of them minorities – to dramatize our disapproval of violence, even though over 150 Death Row inmates have been exonerated since 1972. Race, especially if the accused is black and the victim is white, remains the overwhelmingly primary factor in death penalty decisions. My earlier response does not warrant posting. It is unresponsive on many levels: most importantly the confusion in examples and in understanding of the conflict of Dyonysus in our personal lives and how the collective digests the conflict. Please delete my earlier post and I will try to contribute something more thoughtful to your nuanced thinking.